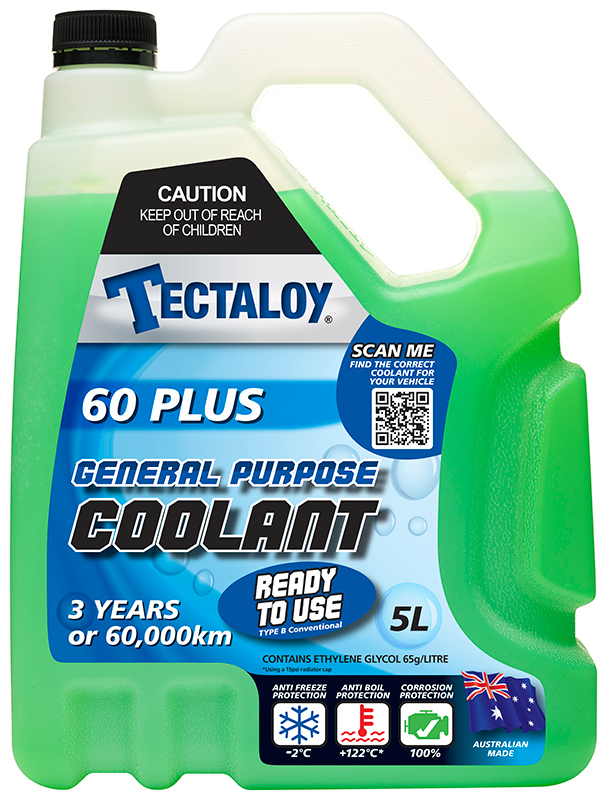 Tectaloy 60 Plus Green General Purpose Coolant is a pre-mixed radiator coolant designed for general purpose use. 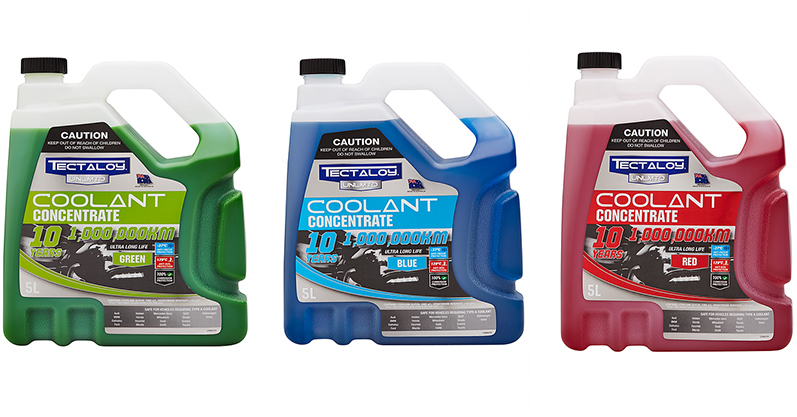 It is formulated to meet the demands of normal passenger vehicles under light to normal driving conditions. 60 PLUS will protect against overheating, aluminum corrosion, general rust, heat transfer loss, and rubber hose breakdown. It is available in 1L and 5L. 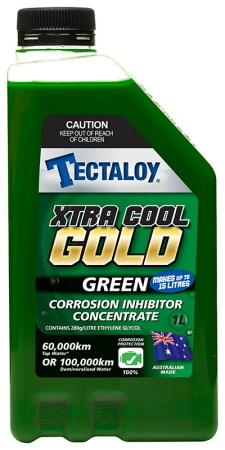 Xtra Cool Green Radiator Corrosion Inhibitor Concentrate contains Ethylene glycol based corrosion inhibitor concentrate with 2 years / 40,000km life span. 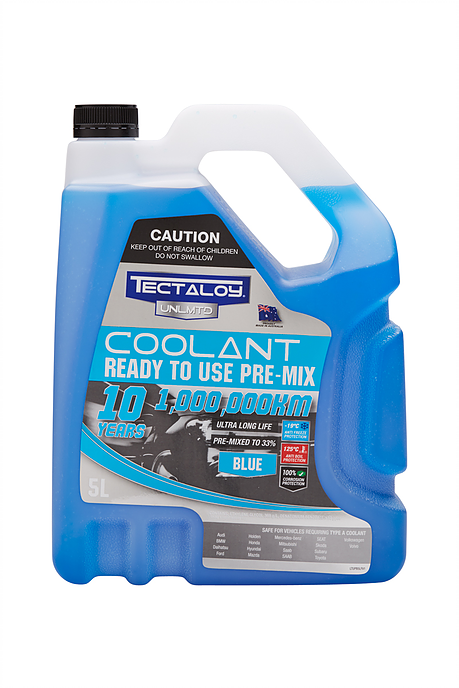 500ml treats up to 10 litre system. It has 100% Corrosion Protection. Exceeds Australian standard AS2108.2004 Type B. Exceeds ASTEM D 4340. 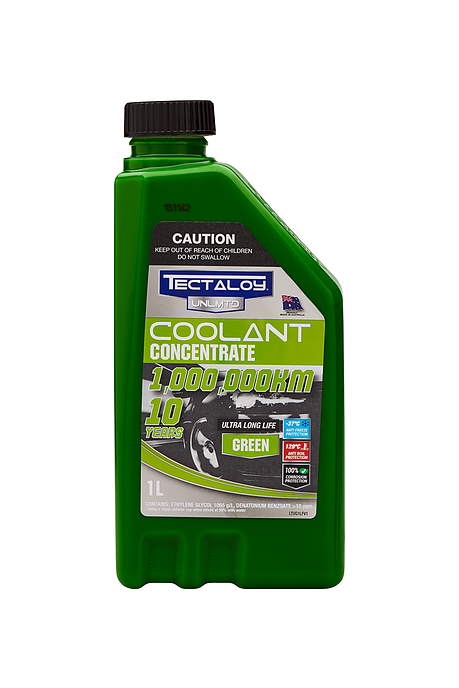 It keeps cooling water clean and rust free, reduces corrosive attack on aluminium and cast iron, and will not harm radiator hoses. It is available in 500ml. 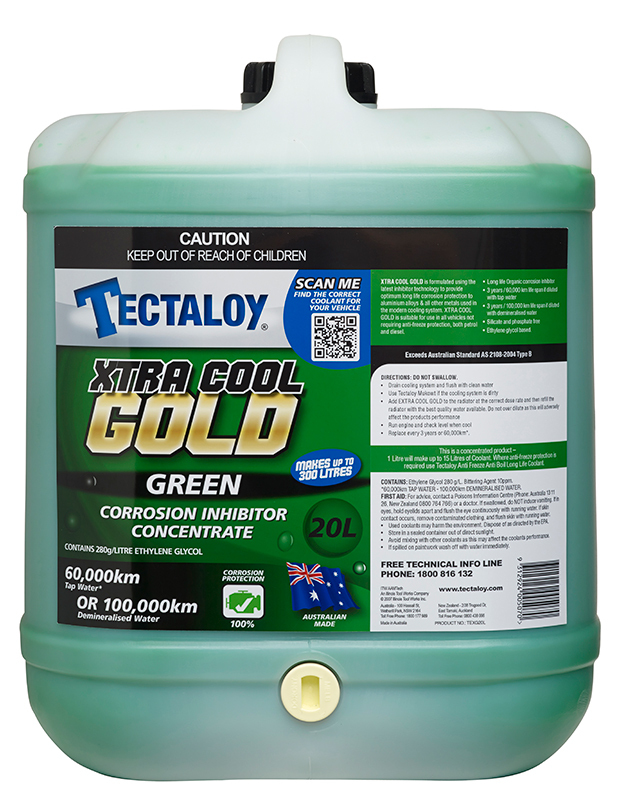 Xtra Cool Gold Radiator Corrosion Inhibitor is ideal for use in all vehicles not requiring anti-freeze protection, both petrol and diesel. 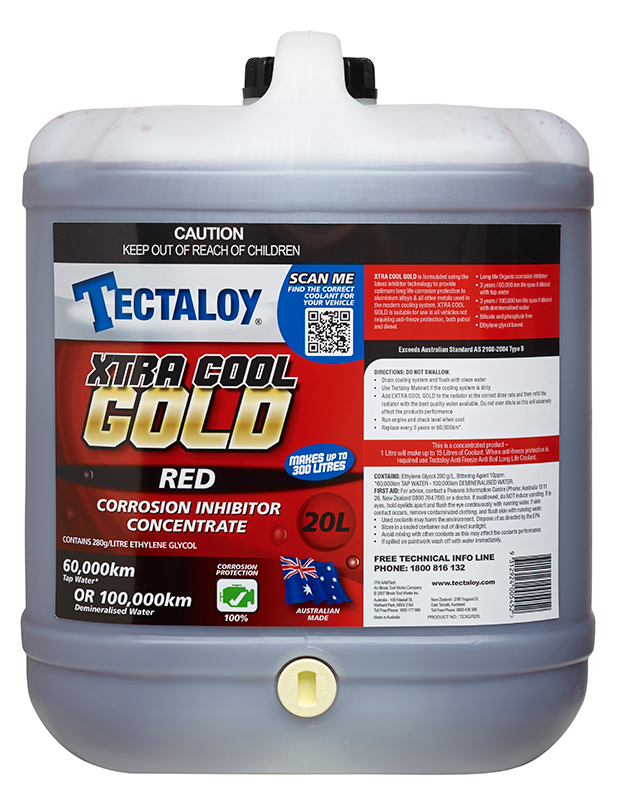 XTRA COOL GOLD is formulated using the latest inhibitor technology to provide optimum long life corrosion protection to aluminium alloys & all other metals used in the modern cooling system. 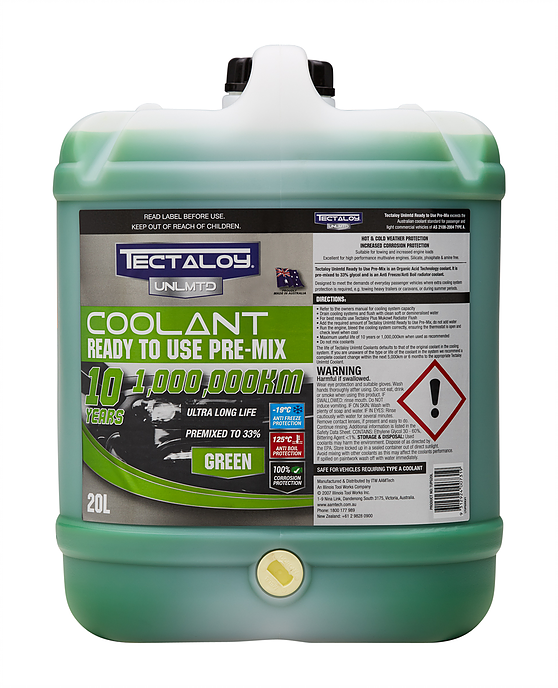 Tectaloy Mukowt is an excellent cooling system cleaner and pre-conditioner for use prior to filling with conventional anti freezes, coolants and inhibitors. 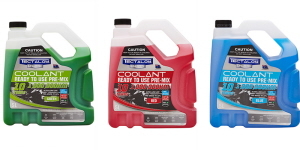 Its gentle acting alkaline solution is very effective at removing oil and sludge. Tectaloy HD2 is a fast acting heavy duty acid based radiator flush which is safe to use in all vehicles, effective in helping to remove rust and scale from the cooling system. 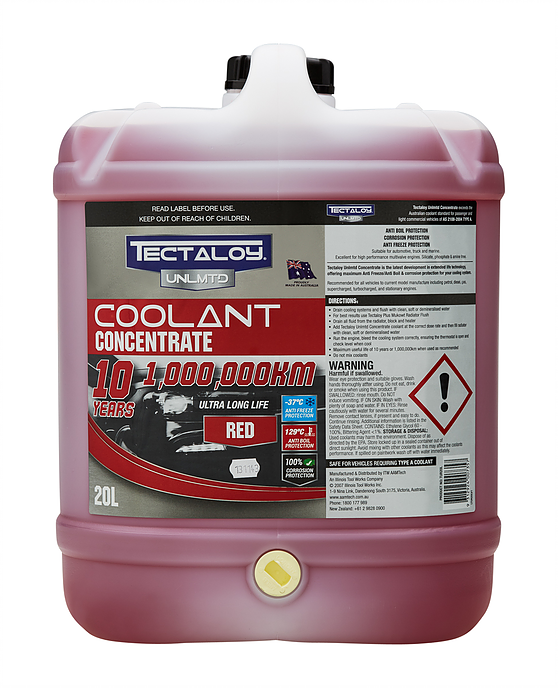 Tectaloy HD2 Radiator Flush has been formulated to maximise the performance of organic coolants in your system. Tectaloy Radiator Stop Leak is an emergency fix specifically created to be suitable with the complete Tectaloy range of coolants and inhibitors. It will quickly seal leaks in radiators, heaters, thermostat housings, water pumps and is effective at controlling gasket seepage. Tectaloy Unlimtd Concentrate Coolant is designed to meet the everyday demands of petrol and diesel vehicles. 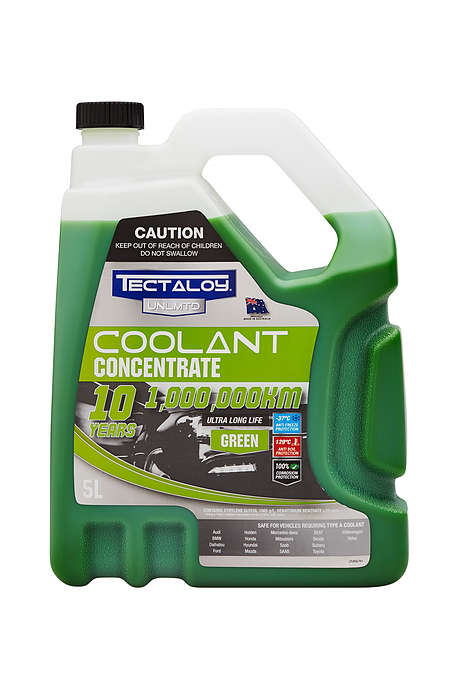 The unique formula of Tectaloy Unlmtd Concentrate allows extra cooling system protection when required, such as four-wheel driving, towing heavy trailers or caravans. 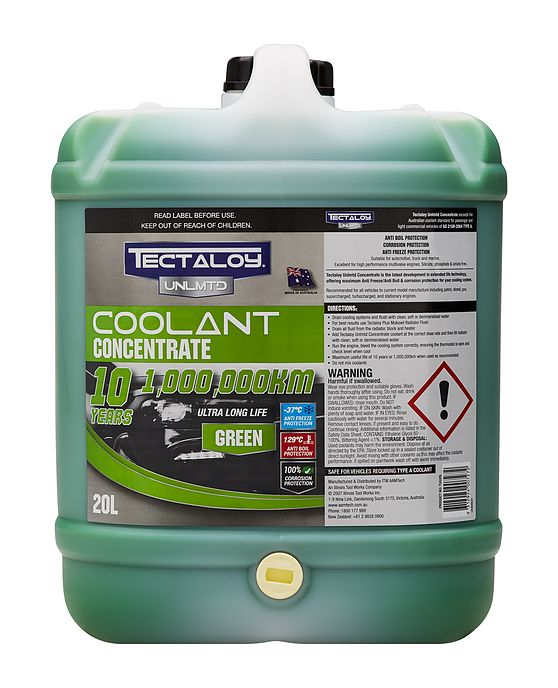 Tectaloy Unlmtd Concentrate is the latest development in extended life technology, offering maximum Anti Freeze/Anti Boil & corrosion protection for your cooling system. 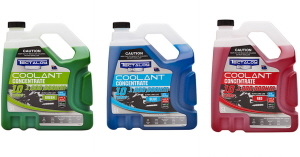 Recommended for all vehicles to current model manufacturing standards including petrol, diesel, gas, supercharged, turbocharged and stationary engines. 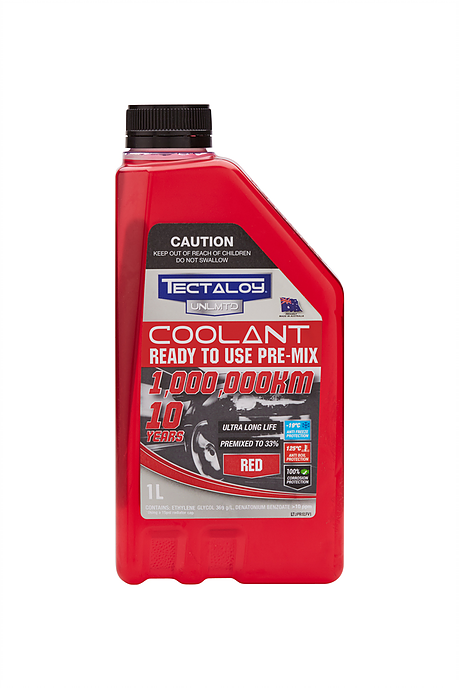 Tectaloy Unlmtd Ready to Use Pre-Mix Coolant is designed to meet the everyday demands of petrol and diesel vehicles. Its unique formula allows extra cooling system protection when required, such as four-wheel driving, towing heavy trailers or caravans. Tectaloy Unlmtd Ready to Use Pre-Mix is an Organic Acid Technology (OAT) radiator coolant, pre-mixed to 33% glycol concentrate. 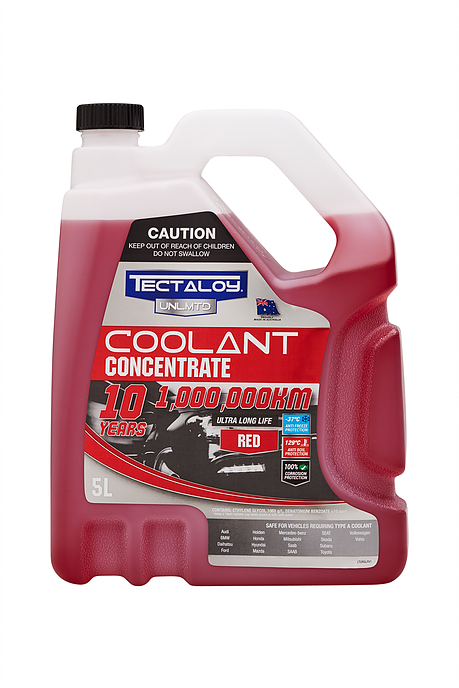 This is the perfect choice of coolant for applications where an extra load is placed on the engine.